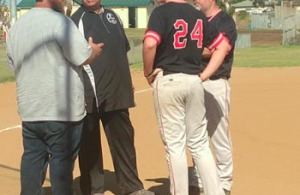 RANCHO SAN DIEGO (4-6-2019) – Being competitive simply isn’t in the vernacular of West Hills coach Mickey Deutschman, who owns more than 1,100 victories as owner/manage of the San Diego Stars, an area semipro and summer collegiate baseball program. This season, due to an off-season procedure on his heart, “Mickey D.” simply hasn’t been able to contribute as much as he would like at practice or in some early-season ballgames. But as better health returns to the 70-something-year-old coach, so has the fortunes of the Wolf Pack. Deciding to revamp his entire lineup card, it took more than six innings to produce results, but, boy, did they. Limited to no runs and a mere four hits through six frames, West Hills pieced together three runs in the top of the 7th inning to produce a shocking 3-2 verdict over Steele Canyon, previously the unbeaten leaders of the Grossmont Valley League. Kai Dennis held the Cougars to just three hits and one earned run in five innings on the hill. Gavin Kondyra followed with two frames of shutout ball, limiting the hosts to just one base hit to collect the victory from the bullpen. But it was the “new-and-improved” lineup which finally came together. With Steele Canyon just three outs away from a shutout victory to sweep the series, instead, Devin Bevilacqua was hit by a pitch to lead off. Kondyra followed with a single, both advancing into scoring position on a passed ball. Then the patchwork batting order started to move. Center fielder Kole Klingerman, who began the season in a terrible 4-for-23 (.174) hitting slump, is now among the hottest for the Wolf Pack. He registered a basehit to give him a .409 mark over the past three weeks, plus an RBI to get the team on the scoreboard. 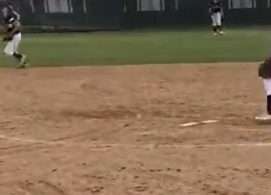 The game could’ve been tied, but Steele Canyon shortstop Sebastian Granados was able to knock down the ball and prevent it from rolling into the outfield, forcing Kondyra to stop at third base while Bevilacqua scored. Two batters later, Parker Craft, mired in his own 1-for-13 slump, recorded a productive out by lifting a simple fly ball to left field. Kondyra tagged up and scored on the sacrifice fly, leveling the ballgame at 2-all. No. 9 hitter Peyton Honick then bunted the ball on the rattled Cougars, beating the throw to first base for a scratch single. 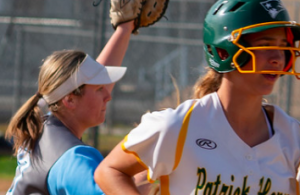 But when the ball was misplayed, both runners took two additional bases with Klingerman coming home to move the Pack in front on an unearned run. Kondyra then retired Steele Canyon in order for the victory to revamp the GVL standings. The Cougars remain in first by a half-game, but are now even in the loss column with El Capitan and idle Valhalla. West Hills jumped up to fourth place and are just 1.5 games out. Steele Canyon snapped the scoreless pitchers’ duel with a pair of late runs in the 6th. Jake Entrekin accepted a lead walk, with courtesy runner stealing second base, then scoring on a Richard Pedrin ground single up the middle. Pedrin would later reach third base on a passed ball, then Jonathan Ramirez delivered a clutch, two-out single for the insurance run. The Cougars also had an opportunity to score in the 5th, but Bevilacqua fielded a grounder to start a double play, firing home to catcher Andrew Ritayik, who went to Kondyra at first base. The Cougars also turned a double play in the 4th. First baseman Billy Tellous, better known as the county home run leader, snared a line drive, then fired the ball to second base to catch a runner off-base. For West Hills (4-12 overall, 3-3 GVL), Joe Thrailkill, who was batting third for the first time, and Kondyra, both registered a pair of hits. The victory also ended a 6-game series losing streak to the Cougars. Steele Canyon (9-6, 4-1 GVL), which pounded Wolf Pack pitching on Wednesday, finished with just four singles. Brad Barkley went 6.1 innings for Steele Canyon, allowing one unearned run. “Things just didn’t go our way but no one said it would be easy so it’s time for us to bounce back,” Barkley said. EL CAPITAN 5, MOUNT MIGUEL 4: At Hostetler Field in Lakeside, it’s not often that a relief pitcher is summoned in the 2nd inning. So it some time for the Vaqueros’ Larry Snow to become fully situated. However, moments after giving up the lead, the El Capitan defense executed a perfect relay for an inning-ending out at the plate. That was enough for Snow, who followed with three shutout innings to cap Friday’s (Apr. 5) GVL victory over the Matadors. Snow finished by allowing just one earned run over 5.2 frames. Snow also collected the victory when the Vaquero offense also became motivated on the relay — center fielder Connor Crist too second baseman Dom Baker to catcher Jake Bergherm for the tag out — responding with three runs in the half-home of the 4th to garner the lead for keeps. Loading the bases on a walk, single and an error, Barker singled to left to tie the contest, as Charles Rodriguez and Snow scored. El Capitan then grabbed the lead on what was reported as a straight steal of home by Barker. Valhalla, just a half-game behind Steele Canyon. Mount Miguel (4-11, 2-4 GVL, including a win over Valhalla) received two hits each from Austin Ortiz (including a double) and Johnathan Frivaldo. “Austin Ortiz had a really good day,” Mount Miguel head coach Frank Coit said. “He hit the ball extremely hard. “It was two very evenly-matched teams today we almost pulled off the sweep. I’m extremely happy with how my team is playing right now. We actually feel like we can compete with anyone and actually they are. “Our pitching and defense has been fantastic. I can’t say enough about our. kids’ effort and how hard they are competing down to the last pitch Everything that I am asking of them they are giving me. The bottom of the batting order — Nico Camacho and JoJo Castillo — drove in runs, along with leadoff batter Austin Ortiz. In addition, Laverdiere and Cameron Beauzec stole bases. Sophomore Thomas Ringer pitched all six innings for the Matadors, notching six strikeouts. “Another great ball game by my kids against the D2 team,” Coit said. “Thomas Ringer pitch very well and gave up only three earned runs. “We had the lead, 4-2, but gave them back a few runs with a couple of miscues. Nothing drastic, just a little small miscue here and a little small miscue there and a couple of runs came in. MONTE VISTA 13, EL CAJON VALLEY 0: At Spring Valley, a trio of Monarchs pitchers — Andy Canedo, David Vega and Carlos Esparza– combined to toss a 1-hit shutout in GVL action Friday (Apr. 5). Canedo was lifted after four no-hit innings with an 11-0 lead, striking ou 7 batters. Vega and Esparza went one frame each in the run-rule shortened contest. 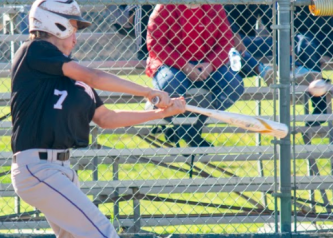 The standout on offense was Monte Vista third baseman Jacob Savoy, who drove in a career-best six runs with three hits, including a pair of doubles. “I felt good and confident and so did my team because without them we wouldn’t get the chance,” Savoy said. “With the hitters in front of me, I have confidence in them to get on and score some runs. Savoy’s first two-bagger came in the 1st, clearing the loaded bases for a quick 3-0 advantage. “Usually at the plate, I attack the fastballs in the zone and just try to drive them for hits,” Savoy said. Chris Leask tallied three times, while Savoy scored twice, along with Ernie Arambula ((who tripled), Andy Canedo (who doubled) and Cam Schuler for the Monarchs (10-8 overall, 2-2 GVL). For ECVHS (2-9-1, 0-5 GVL), Mario Jacobs registered the lone hit then stole second base in the 5th.